The King's River flooded the Priory at Kells on Friday 4th. There was a total of almost 30mm the previous day. The first week of December was very mild and windy but also very wet. The month continued in this this fashion, culminating in severe floods on the 30th at Thomastown and Graiguenamanagh. It was a remarkable month for both mildness and rain. It was the mildest December ever recorded in Kilkenny. It only dipped below zero on one occasion, the early hours of Christmas Day when a min of -0.4° was attained. There were ten days when it exceeded 13° with the highest temperature occuring on the 16th, 14.2°. It was also very wet. In fact it was the wettest month ever recorded in Kilkenny. Not far off a quarter of a metre of rainfall. The period between Christmas and New Year's Eve was especially wet and the wettest day of the month (and year) was the 29th with 26.1mm. That rain was accompanied by strong winds too (associated with storm "Frank") and the highest gust of the month, 83 km/hr, was recorded at noon on the 30th. Cattle grazing peacefully at over 250m ASL above Johnswell on the 20th. Kilkenny City is in the distance. A murky, cloudier air mass is clearing to the south, replaced by clearer air of Arctic origin. It was the beginning of the only cold snap. Prior to this it was an exceptionally mild November. Both day and nightime temperatures were well above normal with no frost. It was the mildest November in 18 years and second warmest since records began (1957). Mean minimum temperatures were the same as last October and there was only one night with an air frost, the morning of the 23rd when the temperature dipped to -2.2°. The 10th was the warmest day when it reached a pleasant 17.3°. The monthly rainfall total of just over 100mm, was a little above normal. But the biggest event of the month occured on the 17th when storm "Barney" traversed across the south of Ireland bringing gales and power cuts. The top gust of 116 kph was the highest November gust in Kilkenny since 1959. Another fine October morning at the village of Owning, Co. Kilkenny. The month began very dry with many pleasant sunny days as high pressure took control. The nights were cool however with plenty of grass frosts. After a cool first three weeks, a mild end to the month ensured that the mean temperature was exactly normal. The lowest temperature of -0.6° was on recorded on the 15th. The warmest day was the 1st with 18.5°. The final week was wet, but overall rainfall was only 59% of normal, the driest October since 2007. The stongest gust of almost 53 km/hr came from an easterly direction and was recorded on the morning of the 26th (which also the wettest day of the month). Harvest home. Near Foulkstown on the afternoon of the 17th September. There was very little rainfall up to September 11th and this allowed the late harvest to proceed at pace. The month ended too on a very dry note. Overall though temperatures were a little down on normal. It was colder than normal - in fact the coldest September since 1994 (21 years). That said there were many fine, dry, sunny days and the temperature reached 20° on the 8th. The nights were cold though with 5 mornings when ground frost was recorded. It was a dry month with only 44% the normal rainfall - although not as dry as the exceptionally dry September in 2014. The wettest day was Friday 11th when 10.9mm fell. The stongest gust of 46 km/hr was recorded on the 24th. St.Canice's Cathedral and Round Tower on the morning of the 12th. The Arts Festival was in full swing. Luckily the weather had picked up and gave a few nice, dry days finally, after a run of cool, cloudy days since early July. It was cooler than normal but slightly warmer than August 2014. There was no real warm spell however and the maximum temperature of the month, 22.8° was recorded on the 13th. The lowest temperature of 5.4° was on the 8th. There were two mornings when ground frost was recorded. Despite a dry first three weeks, the last 10 days were wet and monthly rainfall was slightly above normal but not as wet as last August. The wettest day was the 25th when 1" of rain (25.4mm) fell. The stongest gust of almost 56 km/hr was recorded on the 2nd. Summer 2015 Summary: It will go down as a poor Summer especially because there was no real warm spell. Compared to the 30 year normal, it was cooler than normal. Our coolest since Summer 2011. All three months had mean temperatures of less than 15°. This was the first time since 1988 that this happened. It was however drier than normal - mostly due to a dry June month. The warmest day was on July 1st when it reached 24°. Gathering clouds over the Castle on the morning of the 28th. After a promising start to the month when the temperatures reached 24°, the rest of the month was disappointing with mean temperatures below normal and plenty of rainfall. Overall it was a cool,dull, wet month. Mean temperatures were 1° below normal (the same as 2012). Only 1 day saw temperatures exceed 22° (24.0° on the first). In fact there was ground frost on 2 occasions. The coldest night was the 25th when it dipped to 5.8°. Total rainfall was 80.2mm which is 125% of normal. The wettest day was Saturday 25th through to Sunday morning when 17.5mm was recorded. Top gust was on the evening of the 27th when the wind gusted to gale force 8 (63 km/hr). 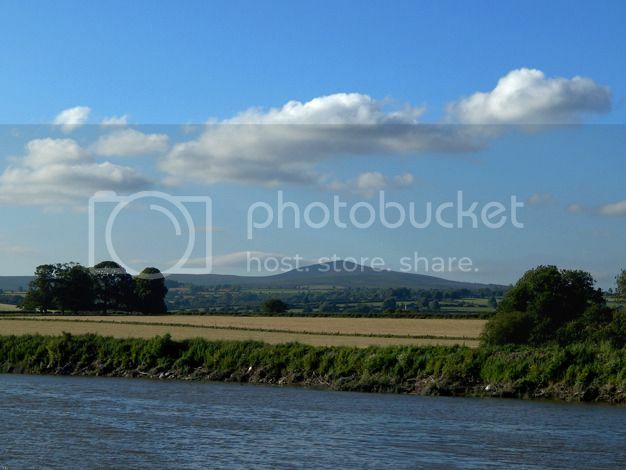 Looking north over the River Nore towards The Rower, with Brandon Hill in the distance. During mid month there were several fine warm days like this one on June 20th. The start of the month was cool especially at night with many ground frosts. The month finished on a high though with dry weather and warm temperatures. It was a dry, pleasant month, after a cold wet start. Mean temperatures were exactly normal. The month started cold with a total of 8 days with ground frost. The lowest temperature of 3.6° was recorded on the 1st. Towards the end of the month temperatures picked up considerably with the warmest temperature, 23.0° being recorded on the last day. It was a dry month with a total of 27.6mm. The driest since 2006. The wettest day was the 1st of the month when 11.4mm fell. Very little rain fell after the 4th of the month. A passing hail shower south of Thomastown on Tuesday 19th May. The first half of May was cool and very wet with plenty of ground frosts. We had to wait until the 21st before things got milder. It was a cool and wet month. Mean temperatures were the coldest since 1996 locally. There were ten days with ground frost. The warmest day was the 23rd when it reached 18.7°. The lowest air temperature (2.1°) was recorded on the 1st. It was also a very wet month with 102mm of rain making it the wettest May since 1993 (22 years). The start of the month was especially wet with over 1" of rain (25.6mm) recorded on the 2nd. The Ossory Road & Pedestrian Bridges illuminated by the evening sunshine on a warm Easter Sunday (5th April). After a seemingly endless time, the weather finally warmed up just in time for the Easter break with temperatures peaking near 16°. It was a fine sunny month with mean temperatures 0.5° above normal. The days were warm but the nights were often cold with as much as 22 ground frosts. The minimum temperature was -1.4° on the 26th and peaked at 19.7° on the 7th. Rainfall was well below normal, with a total of only 19.4mm. March started off on a cold note with some early morning snow showers on the 2nd and 3rd but there were nice evenings too such as this one at the Bridge House, John Street on Sunday 8th. It was a little colder than normal with a total of 9 air frosts. The lowest temperature of month, -2.6° was recorded on the 14th. However the month was sprinkled with some pleasant days and it reached 15° on three occasions : 7th, 20th, 28th. It was a drier than normal with the wettest day being the 11th when 11mm was logged. The month ended on a very windy note when a gust of 110 km/hr was recorded at 22:25 on the 30th. This is just 5 km/hr shy of the highest March gust recorded in Kilkenny. It was a cold month. Mean temperatures were almost 1° below normal. It was the coldest February for 5 years. The lowest temperature was recorded on the 3rd when it was just shy of -5°. The mildest day was the 25th, when it reached 13.3°. It was a dry month, but February 2013 was drier. The strongest wind gust of 80 km/hr was recorded on the evening of the last day of the month. Winter 2014/2015 Summary: Overall it was a colder than normal Winter season, not exceptionally so - but everyone of the Winter months still had below normal means. It was the coldest Winter for 4 years. The Winter was drier than normal, the driest for 3 years. The strongest wind gust of 86 km/hr and warmest temperature of the Winter were both recorded on the same day, January 9th. The lowest temperature of -4.9° was recorded on 2 days, December 29th and February 3rd. Snow on the road at Greenshill, Kilkenny on the morning of the 14th. The 2cm of snow did not lie for very long but caused traffic disruption because it settled readily on all surfaces and became hardpacked. Just 6 days earlier there was record breaking January warmth when Kilkenny recorded its highest every January temperature of 16.2°. It was a month of two halves. The second half was cold and mean temperatures ended up slightly below normal. Rainfall was below normal too. This despite there being 25 days with more than 0.2mm of rainfall.